For the past 3 years, a cohort of 408 school libraries has consistently responded to the annual Colorado School Library Survey. Their responses give a glimpse into some of the trends in school libraries: students’ use of school libraries is moving towards group visits as opposed to individual visits, collections are changing to reflect a greater reliance on technology even though circulation numbers continue to increase, and finally, use of interlibrary loan is increasing at a substantial rate. An analysis of these trends has been culled from the responses of the cohort and raises some interesting issues for reflection. Since 2005, individual student visits to school libraries in the cohort have decreased by 7 percent (see Table 1). At the same time, group visits have increased by 8 percent. This suggests that the way students use library resources may be changing. 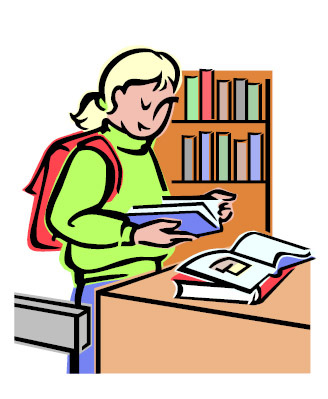 For example, students may visit school libraries with classes or in groups more often to work on school projects. Even though individual visits have decreased, circulation has increased by 7 percent. Students are still checking materials out from school libraries, whether they visit the library in groups or alone. Another interesting trend is the rise in use of interlibrary loan (ILL) services among this cohort of Colorado school libraries. 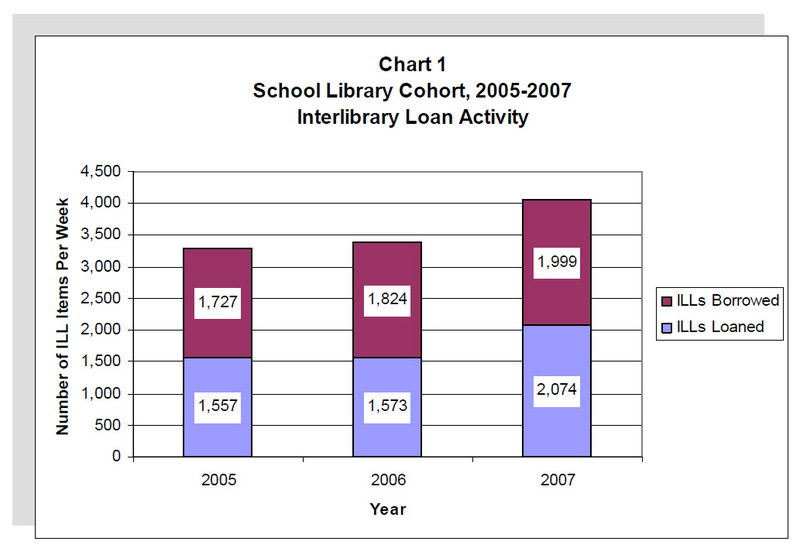 Since 2005, the number of ILL materials both borrowed and loaned has increased substantially (see Chart 1). Total ILL activity has increased by 19 percent among these libraries. 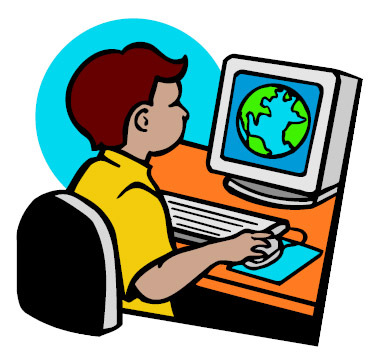 The State Wide Interlibrary Loan Fast Track service, or SWIFT, began in 2000 and provides web-based ILL requesting and tracking services to libraries in Colorado free of charge. According to Lori Smith, SWIFT Coordinator for the Colorado State Library, the majority of items requested by school media specialists via ILL are for teachers. This suggests that, in addition to using the school library resources, teachers are using ILL to supplement their curriculum materials and meet their information needs. At the same time, the user-friendly and free SWIFT system makes inter-institution borrowing easier than ever before. It seems, then, that the increase in ILL use is probably due to a combination of factors, including a need for additional library materials and the convenience of the SWIFT ILL system. While visitation patterns are changing among students, so are the components of school library collections in the cohort. From 2005 to 2007, book collections decreased by approximately 1 percent, or by more than 25,000 volumes (see Table 2). The only types of physical materials that have increased are video and audio, which rose by 1 and 2 percent respectively. While the changes to books, videos, and audio materials are slight, periodical subscriptions changed significantly, decreasing by 9 percent since 2005. This change is probably related to the increased emphasis on technology in the library and classroom, most notably the addition of online reference materials and databases. While it may be somewhat puzzling that physical (versus electronic) resources are staying the same or decreasing while circulation is increasing, this trend would seem to support the idea that while collections are smaller, they are more relevant to Colorado’s students. To some extent, it could simply reflect appropriate weeding policies and practices. 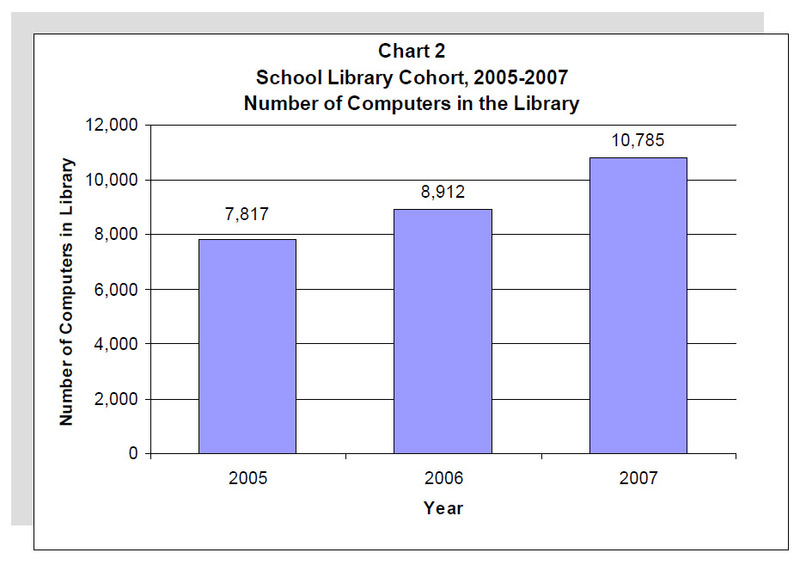 Student access to technology in these school libraries, as might be expected, increased substantially during the period studied with the number of computers increasing by 28 percent (see Chart 2). This isn’t a surprise, given the shift towards electronic collections and increased information sharing occurring in libraries of all types, including those in schools. If the libraries in the cohort are any measure, school libraries have adapted to shifts in technology and changing student needs. This analysis of responding school libraries’ data allows for a few simple conclusions: Colorado’s students continue to visit the library, especially in groups; they continue to check out library materials, despite (or perhaps because of) an increased emphasis on technology; and ILL usage is increasing, especially among teachers. In any case, it is clear that school libraries continue to grow and change as they strive to match their collections and services with their users. Colorado School Library Survey Statistics, 2005-2007 (accessed May 21, 2008). Retrieved from http://www.lrs.org/school_stats.php.